Not sure I'm done processing this set of photos yet -- there's a bit of work to be done. But they're close enough to post. 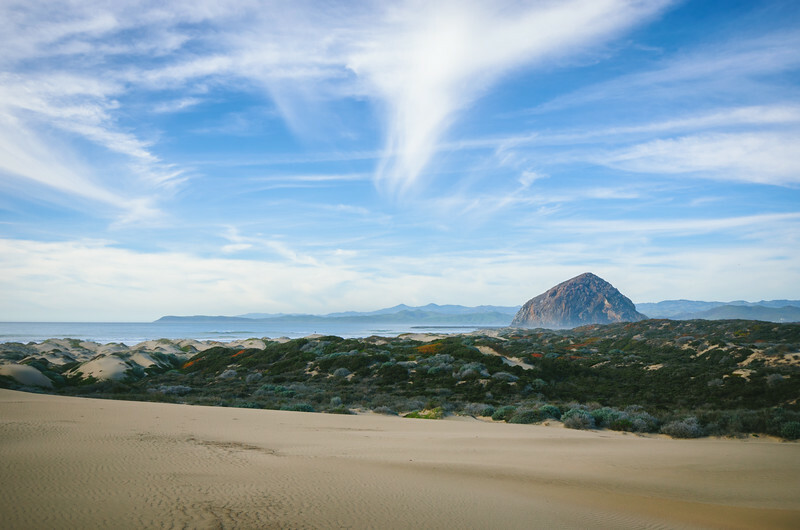 That's Morro Rock, the 576-foot-tall volcanic remnant that sits adjacent to Morro Bay on California's Central Coast. All were taken this past Saturday afternoon from a variety of locations. I think each photo has its strengths although I'm guessing the first one will be the most popular as it's the most overtly colorful and has a nice reflection. It got listed on Flickr's "interestingness" page the other day, which almost never happens to my pics. How'd I get the water to hold still? It's a long exposure in which I kept the shutter open for 25 seconds. That was made possible by using a graduated neutral density filter on my Nikon DX 10-24 wide angle lens to limit the amount of light, thusly allowing longer shutter speeds. I actually under-exposed the image badly -- I thought I had a few good pics already captured in the camera and was guesstimating the exposure time on one last shot as it got dark out. But I shot in RAW and that allowed me to basically save the image by brightening things up and making some other adjustments. The lesson: if it's an image you really care about, shoot in RAW -- it's a way to ensure you have something to work with later. 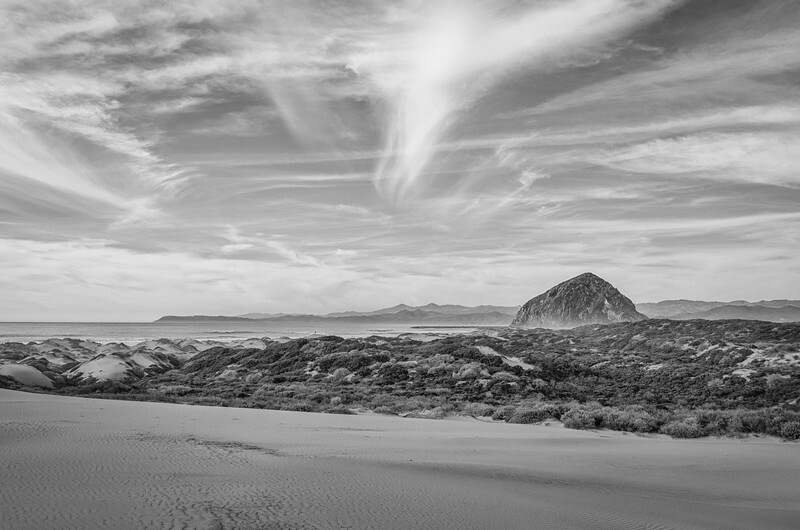 I'm a little bummed I didn't get it exposed properly, but pleased I was able to rescue a pretty nice image. There was nice, soft light for the second image, which almost looks like a drawing. It was taken about two hours before sunset. I'm a wee bit concerned it looks too digital and might try some other things to give it more of a film look. The third image works because of the composition. 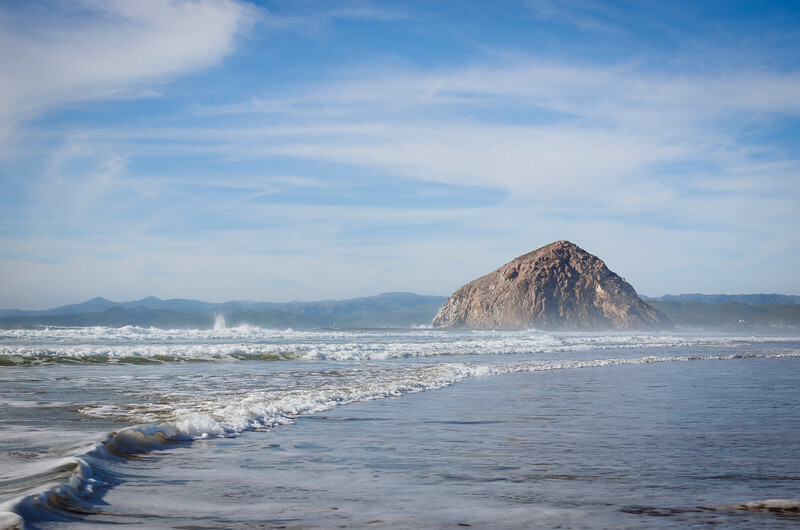 The line of the breaking wave leads the eye straight to Morro Rock, which is actually (shocker!) what I intended. 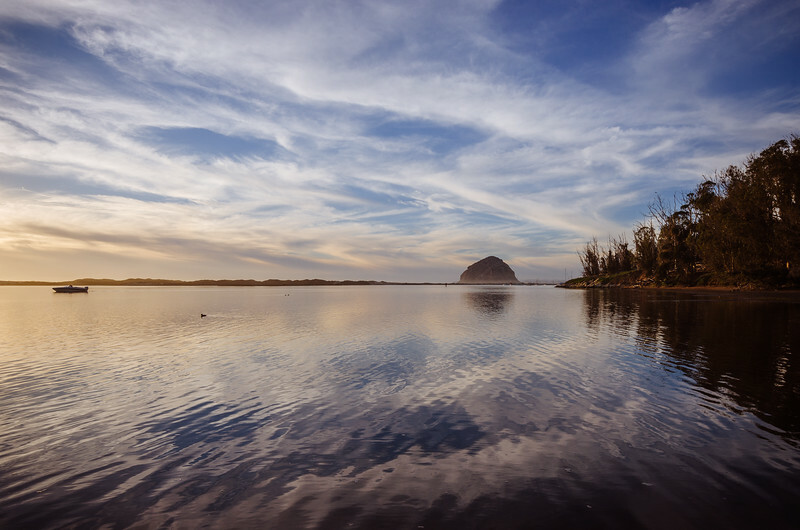 The fourth image was the one I was most excited about while taking the photos -- I really liked the combination of the boat, the duck, Morro Rock and the reflections of the clouds on the water. I still do, but the first photo with the silky smooth water is probably the better one. More photos to come from my long weekend on the Central Coast. There are a few I'm really digging, but need to pop some beers and process 'em first. Please feel free to check out my SmugMug site for all my work. For prints and licensing info on any of the above photos, please hit the "see larger" link and then go to "buy." RELATED POSTS: juvenile bald eagle near Cambria, green hills of a cattle ranch and an egret in Morro Bay.